Spring is stealing into my yard, inch by inch. The rains have given me long shaggy grass (hey, I didn’t plant it, it came with the house!) and an abundant crop of,um, native plants. 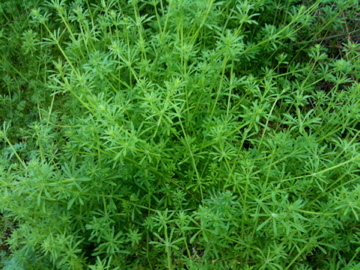 One of the most tenacious of these is Galium aparine aka cleavers. Also called goose grass or velcro plant, this stringy stuff is all over the place, happily grabbing at my ankles any time I try to walk through the yard. The only use I’ve found for it in the kitchen it to make a tea/tonic. I actually like it. 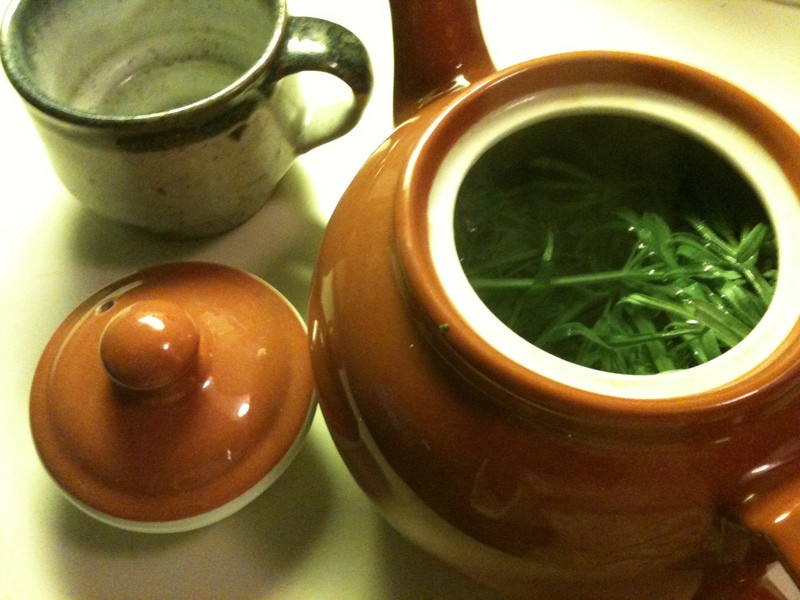 It tastes kind of “green”, grassy but pleasant I think. Take a good handful of young cleavers in early spring. Discard the roots and any damaged or brown bits, check well to make sure there are no bugs or other foreign matter attached, and put it in a teapot. Boil water, cool for a minute and pour over cleavers. Let steep for a few minutes, and enjoy. I found a recipe that suggested cooking it like spinach, but I found it bitter and stringy-tough. I cooked them for quite a while, but cleavers never seemed to cook soft. I think I’ll stick to making tea as long as the plants stick around! I hate that stuff! It is all over my yard and gets stuck in my shoe laces. I never knew what it was before. Rachel, I was just wondering what that was called. It has also taken over my yard. The lawns just been mowed, but maybe next time I’ll make tea! Yup. Seems that, since we had an actual winter followed by rain, it is taking over the earth!